Share Guay makes the top 10 ! Guay makes the top 10 ! 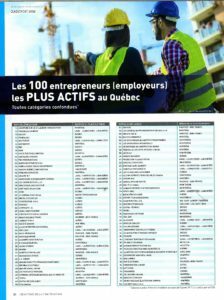 The magazine ” Champions de la construction ” has just published the ranking of the 100 most active employers in Quebec in 2018. We are very proud to announce that Guay inc. ranks 8th on this list. Did you know that we offer technical services including creating lifting plans, ground pressure calculations and feasibility studies?